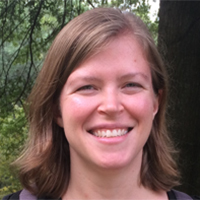 Jocelyn Rodgers has joined Carnegie as a CDAC postdoctoral associate. She is a theoretical chemist with expertise in liquid state theory. Among her interests are the use of molecular simulations to understand the effects of high pressure and other extreme conditions on biomolecule stability, structure and function under pressure. She works jointly with Toshiko Ichiye at Georgetown University and at Carnegie with Russell Hemley. Jocelyn received a Ph.D. in Chemical Physics from the University of Maryland, College Park and from there completed a three-year fellowship with Lawrence Berkeley National Laboratory, where she explored simulation and technique development for the study of coarse-grained lipid bilayers and proteins. Her research interests include biophysics, thermodynamics and statistical mechanics, molecular simulation, and self organization and assembly of molecules.